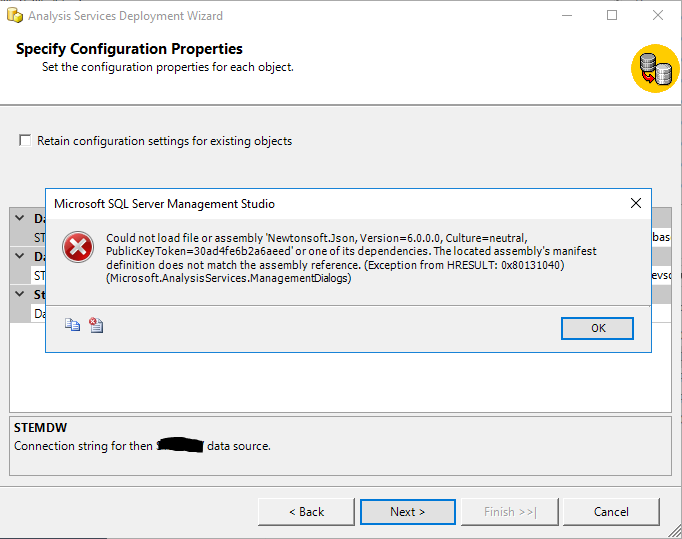 Deploying an Analysis Services Tabular model to SSAS Azure using the Analysis Services Deployment Wizard. Both Visual Studio 2017 & SQL Server 2017 installed on the client. If you look at the folder containing Newtonsoft.Json.dll (2C:\Program Files (x86)\Microsoft SQL Server\140\Tools\Binn\ManagementStudio\Extensions\Application” – substitute 140 for your version of SQL Server) and then right click properties on the Newtonsoft.Json.dll file you’ll probably find that it’s version 10.0.3 or later, but the error message shows that the deployment wizard is looking for version 6.0.x. We therefore have to tell the SSAS Deployment Wizard to use a newer version instead. Use Notepad(++) to open the Microsoft.AnalysisServices.Deployment.exe.config file, which you should find in “C:\Program Files (x86)\Microsoft SQL Server\140\Tools\Binn\ManagementStudio” (substitute 140 as above, for your correct version). Save and close the file, relaunch the deployment wizard, and you should find it all works ok.